It was late in the evening and I was soaring majestically though the air, whizzing around like an acrobatic bumblebee. Somewhere below I could hear a crowd of people chanting my name as I tumbled into a particularly impressive mid-air pirouette. Madame Pym, ringleader and trapeze-artist extraordinaire, swung back and forth in front of me, her short legs hooked over the trapeze and her arms held out waiting to pull me to safety. Reaching forward, I stretched out as far as I could, ready to grab on to Pym and to hear the humongous roar of applause fill my ears. Instead, I felt my fingertips brush Pym's before they slipped away, leaving me grabbing at mothing but thin air. Then I was falling. Down. Published by Scholastic in September. Curses: load of rubbish or for real? Super sleuth Poppy must figure it out when trouble strikes ‘cursed’ play Macbeth… People say Shakespeare’s Macbeth brings bad luck to all who try to stage it. In the case of the Brimwell town production, this seems to be true. An arsonist has struck, burning down the venue. Now the play has been moved to Poppy’s school. But the attacks aren’t over – and the fact that it’s Halloween just makes things creepier. Can Poppy find the culprit and save the play? Circus star. Super sleuth. Mystery buster. Queen of surprises. If Poppy isn’t your best friend yet – why not? What a great book this is! It's got it all: comedy, spookiness, thrilling adventure, a mystery, a treasure hunt and a cast of wonderful characters. There's even a whole load of guinea pigs thrown in for good measure. And it's beautifully written to boot. 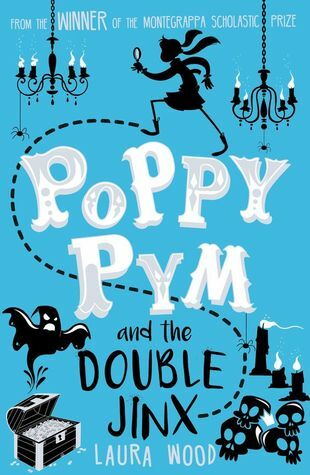 Poppy Pym, who comes from a family of memorable circus performers, is a boarder at Saint Smithen's school. She and her two best friends, Ingrid, who is mad keen on reading, and Kip, who's always first in the queue at mealtimes, set out to discover who burnt down the town hall. Along the way, they investigate the disasters that keep befalling rehearsals of Macbeth and search for long lost treasure. The story hares along at breakneck speed and it's written in short chapters that make it perfect for bedtime reading. Scholastic say it's for children aged 11 and 12, but I know a 9 year old who's going to love it so I'm pretty sure it would also be suitable for book-loving younger children. This book is the second in the series. (How on earth did I miss the first one?) But that didn't detract from my enjoyment of it as it tells a great story in its own right. I can't recommend it highly enough. Don't miss it!